Peru is a land of many contrasts. 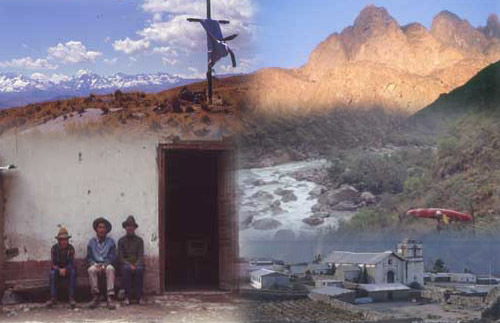 The Western Coast is dry and arid, the central cordillera is dominated by the snow capped peaks of the Andes, and the eastern regions are filled with Amazonian rain forests. Through all of this flow an incredible network of rivers linking many diverse cultures and distinct floral and faunal habitats. This web site has been written to be used as a tool for people seeking recreational information on the whitewater river opportunities within the country. As with any guide please take the information at face value and use judgment in planning your trips. Political situations change as do road conditions and the climate. Many of the river descriptions in this book were written before the devastating floods of 1997-1998 caused by the shifting “El Niño” current. Landslides and massive flooding altered the riverbeds in many rivers creating rapids where none previously existed or vice versa. There are approximately 40 runs described on this site. An effort was made to cluster each river into one of several geographic regions as well as level of difficulty (class 3-5). You can search for a specific river by choosing it’s region, it’s difficulty or by typing the river name into the search box. To see a display showing all their names and ballpark location choose the link on right side of page “River map of Peru”. Additionally you will see a selection of links to other sites including some Peruvian outfitters.